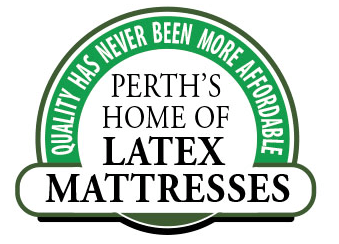 Sleep in Silence with a Natural Latex Mattress from Perth’s Back and Neck Bed Shop. Regardless of your position, every time you move in your sleep your new latex mattress will instantly cradle every curve of your body. With no springs to wake you up or let you down you can expect years of deeper, more restful sleep. You can also expect to experience outstanding support and cushioning for aching muscles and sore joints, especially in the spine, hips and shoulders. The natural hypoallergenic characteristics of latex means no ‘off gassing’ from petro-chemical fumes that are found in standard P.U. foam mattresses. You can sleep soundly knowing your mattress is protecting you while you sleep. Being designed to keep your ‘spine in line’ and take pressure off the joints this allows tired muscles to rest. This reduces ‘tension’ on the body allowing deeper more restful REM sleep. Choosing a natural environmentally friendly, luxuriously comfortable and supportive mattresses may be one of the best decisions you make this year. With no springs to let you down or pockets of air that allow traditional metal spring mattresses to collapse you can look forward to reduced partner disturbance and years of deeper more restful sleep. Treat your body to best Nature has to offer. This entry was posted in Latex Mattresses. Bookmark the permalink.